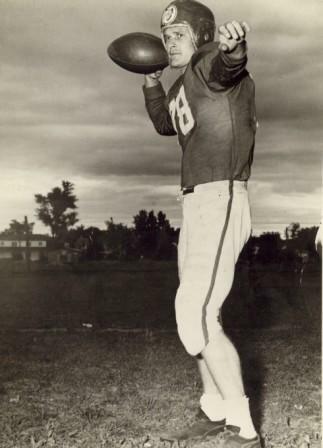 After starring in football, baseball, and basketball at Millikin University, Virgil Wagner came to Canada to join the first Alouettes’ Squad in 1946. Wagner, a superb halfback, made the All-Star Team right from his first year. He tied fellow Hall of Fame member Joe Krol for the Canadian Rugby Union and Interprovincial Union Scoring Championships in 1946. Wagner was the scoring leader in 1947, 1948, and 1949. He is the only player to win both scoring titles four years in a row. Coach Lew Hayman said of Wagner, “…He had real good speed, was a slashing kind of runner and he played both ways, was a good defensive back.” Virgil Wagner played in two Grey Cup games and scored two touchdowns in Montreal’s 1949 victory over Calgary.